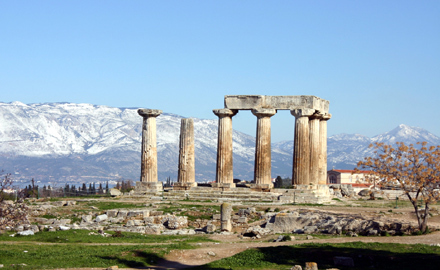 Corinth was situated in the northeastern corner of the Peloponnese — very near the narrow land bridge (isthmus) that connected the Peloponnese to the mainland of Greece. Its strategic location was enhanced due to its proximity to the diolkos — the stone-paved roadway that connected the Saronic Gulf with the Gulf of Corinth. By using this overland passageway, passengers and cargo avoided the difficult and time-consuming trip around the southern end of the Peloponnese.